It’s our goal to make your life easier by keeping you as informed as possible. We’ve compiled a list of some of the most frequently asked questions, so you can access important information quickly and efficiently. If you have additional questions, be sure to contact us with your concerns. What are the beginning and dismissal times for the new K–5 school? How will my kindergarten student be separated from older students on the bus? How can I get more involved in the school? What do I need to do when my child is absent or tardy? What are the dress guidelines at GPA? What time can I drop my child off at school? Can I visit my child at lunch or during class? What if my child has a doctor or other important appointment during school hours? What if my child requires medication due to injury, illness, or a chronic medical condition? How much do school meals cost? What do you serve? Can my child bring a cell phone to school? Can I plan anything special for my child’s birthday? GPA will have a common beginning and ending time for grades K–5. School will begin at 8:15 a.m., with the first bell ringing at 8:10 a.m. School will dismiss at 2:45 p.m.
Back to TopHow will my kindergarten student be separated from older students on the bus? The bus drivers will use an assigned seat process to keep the younger students separate from the older students. Our GPA bus routes will all be relatively short so the time spent on the bus should not be lengthy, thus allowing for better monitoring. Kindergarten students are also only released to their parents at the bus stops after school. Back to TopHow can I get more involved in the school? We believe parent involvement goes a long way in building a strong and successful school environment. Our dedicated faculty members work in tandem with parents to provide the best for each child who walks through our doors. We encourage parents looking for volunteer opportunities to contact our school’s PTO or their child’s classroom teacher. We’re grateful for your support! Back to TopWhat do I need to do when my child is absent or tardy? For student absences, parents must call our attendance line as early as possible detailing the reason for the absence. Siblings may not excuse absences. We require a note upon the student’s return with the student’s name, date, teacher, and reason for the tardy or absence. Illnesses lasting over three days may require a doctor’s note. Students must obtain a tardy pass from the school office if they arrive after the 8:15 a.m. bell. Back to TopWhat are the dress guidelines at GPA? *For the safety of our students, we do require students to wear tennis shoes for P.E. days. We will contact parents for a change of clothes if administration deems it necessary. Back to TopWhat time can I drop my child off at school? For security reasons, we do not permit students on campus before 7:45 a.m. However, after that time, parents may drop their children off at the front entrance, as long as students proceed directly to the playground. We do not allow students into the school buildings or hallways until 8:10 a.m. Please note—there is no parking in the drop-off lane at any time. Please see the student handbook for more details. Back to TopCan I visit my child at lunch or during class? At GPA, we encourage parents to join their child on campus. If you plan to visit your child’s classroom, please contact your child’s teacher to schedule your visit to avoid classroom interruptions. We require visitors to sign in at the front office and wear a visitor’s badge while on the premises. Back to TopWhat if my child has a doctor or other important appointment during school hours? Whenever possible, we ask that parents schedule all appointments before or after school hours. However, when it is unavoidable, students should bring a note on the morning of their appointment with the time and reason for their early release. 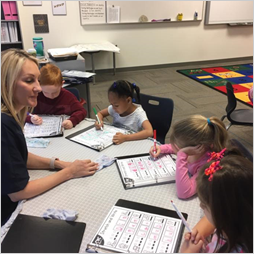 Once the parent arrives to retrieve the student, the office will notify the teacher and ask the parent to sign the student out in the student checkout notebook. Back to TopWhat if my child requires medication due to injury, illness, or a chronic medical condition? Our school health aide administers all over-the-counter and prescription medication in our health office. Parents must sign a medical consent form for any and all medication. We have consent forms available in the school health office. Parents must provide prescription and over-the-counter medication to the school health aide, as we do not allow students to transport medication of any kind to or from school. Prescription medication must be in its original packaging and must contain the name, dosage, and instructions of administration. We do not administer expired medication. Should a student require emergency medical attention during school hours, it is our policy to consult the parent preferences on the student emergency card. For this reason, we ask that you keep your contact information up-to-date with our health office. Back to TopHow much do school meals cost? What do you serve? Our district provides healthy meals for its students that meet state and federal nutrition guidelines. Families interested in applying for reduced breakfast/lunch should contact the school office or the nutrition office at the district to apply. Applications are also available online. Eligibility is dependent on income level. Meal prices are listed on the district Nutrition page. Back to TopCan my child bring a cell phone to school? We do not allow electronic devices and toys of any kind on campus. It is our policy to confiscate these items. Parents may retrieve them from the principal directly. Gateway Polytechnic Academy is not responsible for lost or stolen items on campus. Back to TopCan I plan anything special for my child’s birthday? In keeping with our district’s policy of minimal class interruptions, our school provides a service called Catering for Parents with the goal of celebrating each child on his/her special day while encouraging funds to stay in our district. Our Food Service Department offers birthday packages for delivery that range from $0.50 to $2.00 and include lower calorie/sugar meal options and a birthday flyer. For more details, please contact the district Nutrition Department.